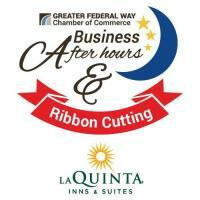 The newly finished La Quinta Inn & Suites offers guests an upgraded experience. Join La Quinta and the Chamber as we celebrate their new re-brand and re-model with a Ribbon Cutting Ceremony and After Hours networking event. Take tours of this spectacular location, meet with staff and network with other South Sound Business leaders. La Quinta Inns & Suites is a brand-new hotel ideally situated between Seattle and Tacoma. Right off the I-5 corridor, guests of the hotel will find themselves near all the Pacific Northwest has to offer while enjoying numerous perks.